content from sources outside of art historical contexts. 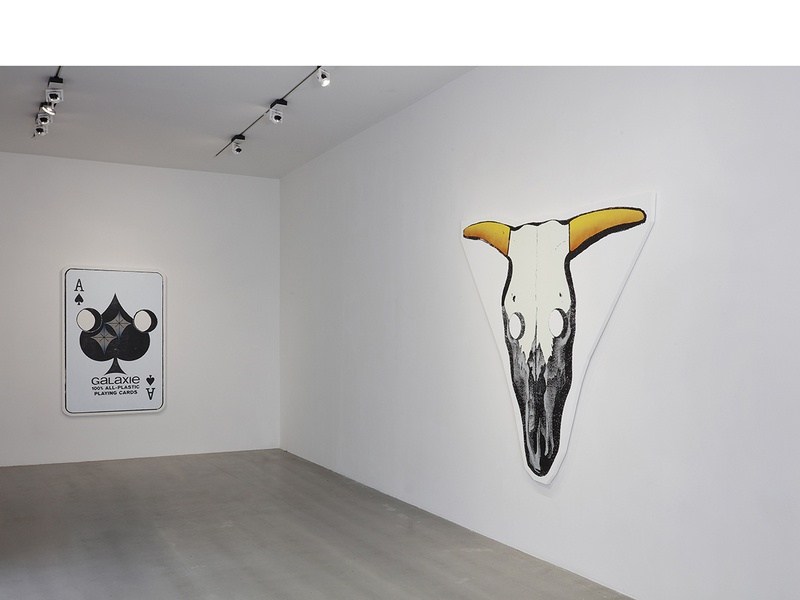 He is particularly interested in subcultures and images associated with the broader American social landscape; these include punk music, bar culture, the automotive industry, horror movies, cattle ranching, and conspiracy theories. Boone mines these sources for iconic forms, borrowing their methodologies and technical processes to render objects full of graphic power and remarkable physicality. Prominently featured in this exhibition are a group of large-scale Mask paintings in which Boone converts images of emblematic objects and people into imposing, mask-like forms by introducing blank spots that stand in for their eyes. The array of images is as varied as it is surreal, with a milk carton, a Goodyear tire, a playing card, Frankenstein, and a Doberman Pinscher all making appearances. On the one hand, these are exercises in anthropomorphism writ large–Boone channels the instinctual human desire to see faces in everything, as well as the psychedelic, animistic state of seeing a living soul in an inanimate form. But they are also monumental expressions of design, printing, and painting techniques the artist has used since his youth, when he regularly designed posters and t-shirts for punk bands. 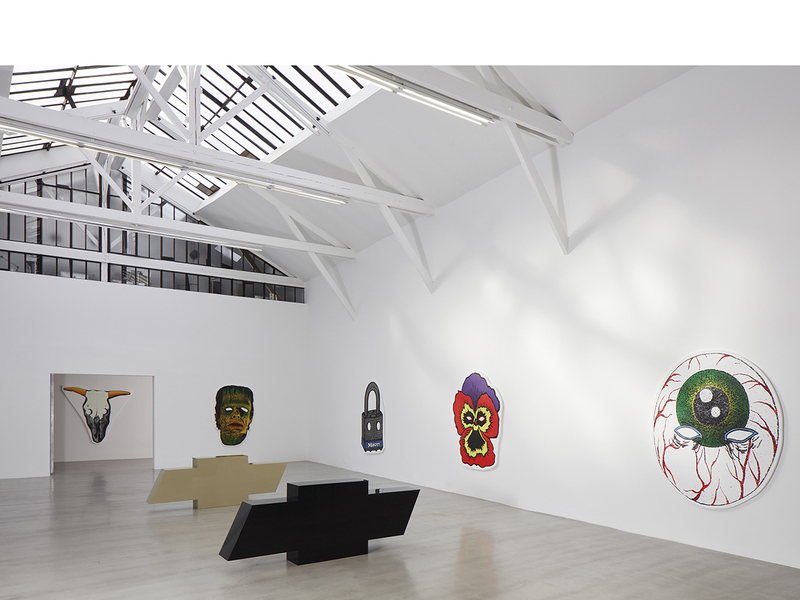 The Mask paintings begin as photocopies of books, magazines, or actual objects, which Boone manipulates by hand on a Xerox machine, altering their proportions by moving the paper as it is being scanned. Silkscreens are in turn made from enlarged versions of the photocopies and used to apply paint to shaped canvases. While Boone has previously made large Mask paintings with a restricted palette, here he utilizes screens to produce works that feature more colors and greater painterly detail. 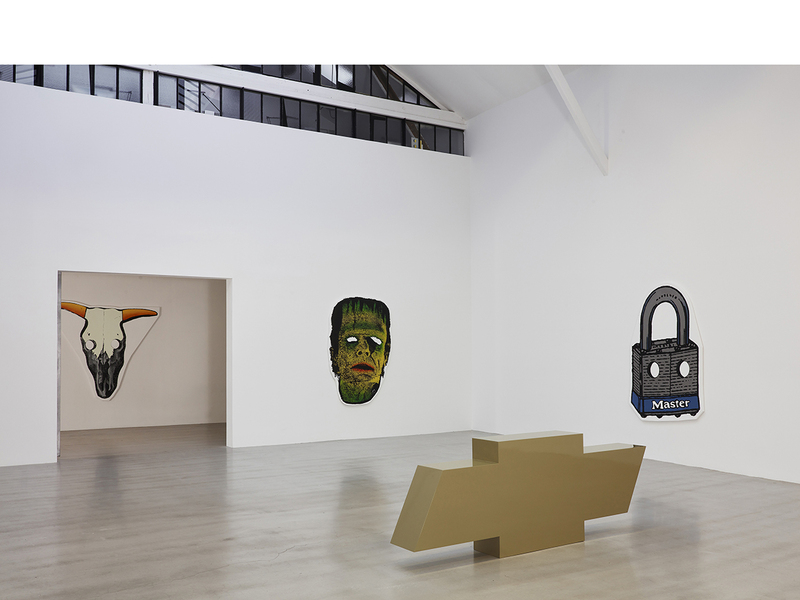 Seen as a group, their presence is simultaneously archaic and humorous, suggestive of the critical bite that animates the work of several of his Los Angeles-based artistic forebears. The new sculptures on view, meanwhile, are based on the globally recognizable cruciform logo of the American automobile manufacturer Chevrolet. 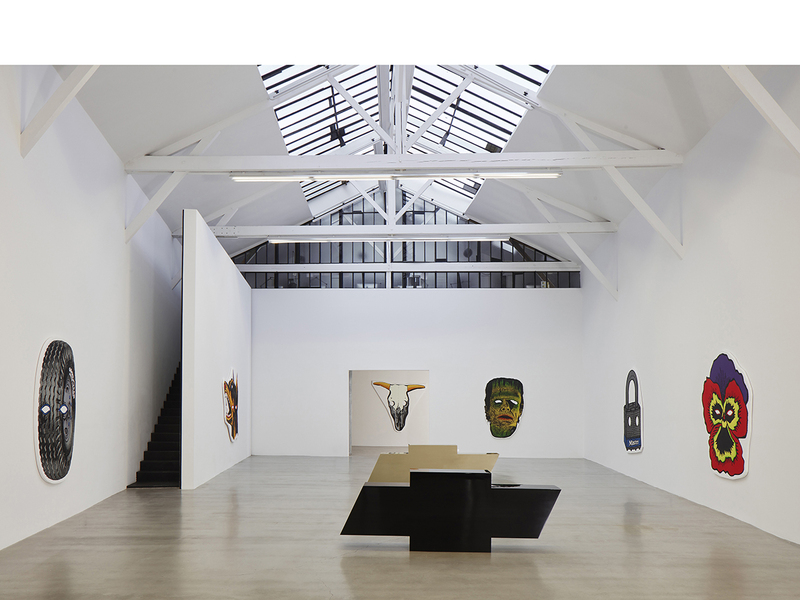 Boone’s objects allow the symbol to be seen as a minimalist, abstract geometric composition in three dimensions and as a strange, otherworldly monolith whose true origins are impossible to discern. They also speak to the tendency to regard the preference for certain commercial brands–especially when it comes to cars–as an ideological, quasi-religious kind of devotion. The artist has painted each sculpture in a different color, using pigments that are traditionally employed in other applications, such as those found on cars and electric guitars. With a brooding quality that counteracts their apparent familiarity, these works are prime examples of Boone’s penchant for tunneling into the dark recesses of the contemporary American psyche and emerging with charged, archetypal artifacts.